If you’re considering going to Burning Man, you might be wondering what a typical day will be like on the Playa. Not to disappoint you, but I’m pretty sure there is no such thing as a typical day in Black Rock City, so the best I can do is tell you how we experience the Burn on a day-to-day basis. We start early every morning because we’re part of the Lamplighters morning pick-up crew, which usually entails working from 8 until 10:30 – 11:00 a.m. picking up the 900+ kerosene lamps that were hung the previous evening, returning them to the work space, and cleaning the lamps in preparation for that night’s Lamplighting Ceremony. Then we make a little breakfast in our RV, and either spend time with our Lamplighter campmates or take off on our bikes to visit art and see friends staying in different camps. If we get hungry along the way, we can usually find a camp that’s serving grilled cheese sandwiches, hot dogs, French toast or something else delicious for lunch. And there are always a plethora of open bars ready to fill our empty mugs. By 2 p.m., we’re usually back in our RV, where we turn on the air conditioner and take a nap during the hottest part of the day. By 4 p.m., we’ve changed into the appropriate costume for that afternoon’s Lamplighter party (there’s one daily between 3 and 5 p.m.). There, we imbibe in the “drink of the day,” and encourage visitors to volunteer to help us light the city. After 5, with the Lamplighting ceremony underway, we usually change into outfits for that night’s revelry and head out to Center Camp and beyond to enjoy Black Rock City by night. We may head for some events that we’ve found in the “What, When, Where Guide” you’ll receive as you enter the gate; or we may have some specific pieces of art we want to see in their fiery nighttime garb. 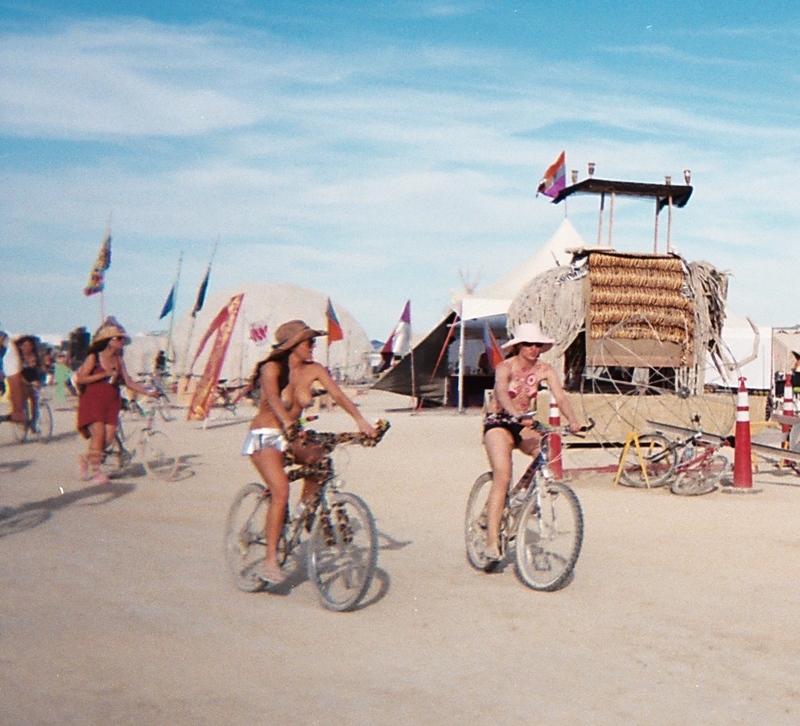 A day on the Playa — clothing may be optional, but a bike is a must. If we’re hungry, we can return to camp where dinner is served after the Lamplighting Ceremony is over (usually a little after 8 p.m.), or we can skip dinner until we get home and raid the kitchen for leftovers. Some nights we stay out well past midnight in search of unique late-night activities, food and drink. It’s a kick to visit the interactive fiery exhibits where we can actually control the flames, or activate a motion-based installation through our own muscle power. We haven’t done much dancing in past Burns, but lately we’ve rediscovered our love of dancing with each other, so we’ll probably hit a disco or two this year – even if the music’s a little loud for us and we’re from a far different generation of music styles. We believe that Burning Man is best if you’re a participant and not just an onlooker, so we not only serve as Lamplighters every year, but we also take shifts as Greeters and Temple Guardians. The four-hour greeter shift always generates some of our best memories as we “welcome home” virgin Burners and veterans while wearing our most elaborate costumes. Serving as a Temple Guardian is one of the most rewarding roles in all of Burning Man, because you’re able to touch people at their most vulnerable moments, and become an integral part of one of the emotional centers of Black Rock City. We love the middle of the night shift, because we’re heading home just as the sun peeks over the mountains that surround the Playa. There are plenty of other volunteer opportunities available, and you can check in at the volunteer center to make choices such as working at one of the radio stations or the Center Camp Cafe, helping out at Media Mecca, or joining BRC’s own DMV (Department of Mutant Vehicles. But for some Burners, simply hanging out, partying and people watching are just right. It’s entirely up to you.